Design Thinking + Diverse Minds are our frameworks to solve problems and uncover solutions that help you turn up the dial on inclusion. Our co-founders bring lived experience of disability and a professional background in strategy and business consulting. Architects, Parents, Designers, Occupational Therapists - and more. Email or call us to chat. Play For All Australia - Inclusive "Play Pavillion"
Play Pavillion "Movement" at Lindrum Reserve Belrose, Sydney. Deliberately designed as an open-ended sensory play experience that all children can participate in. Modular and hand-crafted from sustainable materials. Play is about movement and fun for all. Dip into the carwash - part of our Lindrum Reserve Play Pavillion! Walk, wheel, run, hop, skip, jump! This Play For All Pavilion offers an interactive and sensory play space inspired by (and inspiring!) the sense of "movement" . 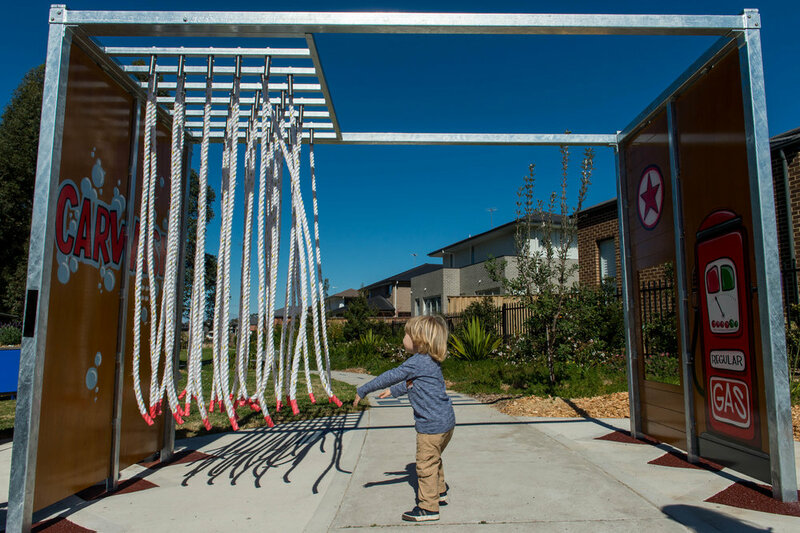 Find it at local neighbourhood playspace - Lindrum Reserve in Belrose, Sydney. Our custom-made Planter boxes also double as play opportunities. We design open-ended play for all children - such as BYO Chalk. This is a great way for children to express their creativity and meet new friends through sharing and interaction. Spin the wheel and see what comes up! Working with designers, educators and therapists, we have established a proprietary system founded on an identified and shared set of child developmental needs. This helps us create play experiences that are creatively inspired, open ended and sensory-rich. Modular, open-ended, sustainable, cost-effective and hand-crafted on Sydney's northern beaches. We collaborate with local artists, educators and engineers to build spaces that include everyone, and invite connection and belonging to your local community. Inspired by the swift, fast and strong super powers of the Shark, this play space is designed to promote big and small movement. Walk, win, spin, ride, skip, run....the choice is yours. Take a spin through the car wash, or just enjoy feeling or looking at the car wash 'rope water'. Sit, touch, smell and even water the sensory planter boxes. There's plenty of space to create your own way to play. Meet our Bat Mascot. He has the super power of sonic hearing, and when you put on his colourful mask, you too will discover different sounds in this playspace. From woks tuned as hand pans, to speaking tubes, a drum ....even the plants are specially selected to rustle and wave in the breeze. Natural sounds in this play space enhance the experience - as local birds of many varieties abound in the trees overhead. Just like the Chameleon, this play space (inspired by the super power sense of 'sight') transforms its colours depending on the time of day and season. With a colourful range of specially selected sensory planter boxes, and a rainbow of colours, you can control what you see.